Last week, I asked you about happiness. Before I get to your responses, I have a story to tell. When I was in my 20s, sometimes I did stupid things. (Didn’t we all?) One fine summer day, a friend and I went for a bike ride. It was hot, so I wore nothing but shorts and shoes. Shirt? Nope. Helmet? Didn’t even own one. There was a huge hill near me and per my speed demon style, I flew down it with reckless abandon. At the bottom, going somewhere between 20 and 30 miles per hour, I hit a bump. And that is when the accident happened. The quick release on the front tire was loose. When I hit the bump at the bottom of the hill, the front tire liberated itself. The fork planted itself in the asphalt and sent me over the bars. My friend, who was riding behind me, told me that I somersaulted in the air before coming back to earth. By some miracle, I rolled out of the accident without serious injury. My body hurt, there was blood everywhere, and the bike was a goner, but by some miracle, I hadn’t hit my head. I also had no broken bones. I was incredibly lucky. Four and a half years ago my husband almost died of septic shock (he was on a ventilator, in the ICU for a week, and away from home for a month). Since then he’s had multiple very complex surgeries to try and repair the damage done. That event was a turning point in my life-so much so that I usually refer to events occurring “before” or “after” he got sick. Before that I might be upset about a project at work, frustrated that the trash wasn’t taken out, or other little things. Like Liz, I should be thankful for every single day after my accident. I could have been dead or paralyzed. Instead, a couple weeks later, I was back to normal. My genetic component has set up a Bad Wolf Sanctuary, where naughty canines get spa treatments, mani/pedis, and daily pep talks from high-paid (de-)motivational speakers. I won’t pretend that it’s not a real problem for me, especially when some external situation that knocks me around a bit. My best tool is structure. I know my physical, mental and emotional triggers and avoid them. I know the things that help me (like a regular sleeping schedule that works with my circadian rhythms, taking vitamin D, positive self-talk, etc.). I curate the information I take in. I focus on ways that the things I CAN control prepare me to weather the things I can’t. That’s less than explanatory, so an example would be: I can’t control stock market volatility, but I can control how often I look at the stock report. Worry is like a rocking chair, it will give you something to do but it won’t get you anywhere. I use logic and gratitude to help the ‘good wolf’ win. Although you may not always be able to avoid difficult situations, you can modify the extent to which you can suffer by how you choose to respond to the situation. Proper utilization of time is so important. While we have this body, and especially this amazing human brain, I think every minute is something precious. Our day-to-day existence is very much alive with hope, although there is no guarantee of our future. 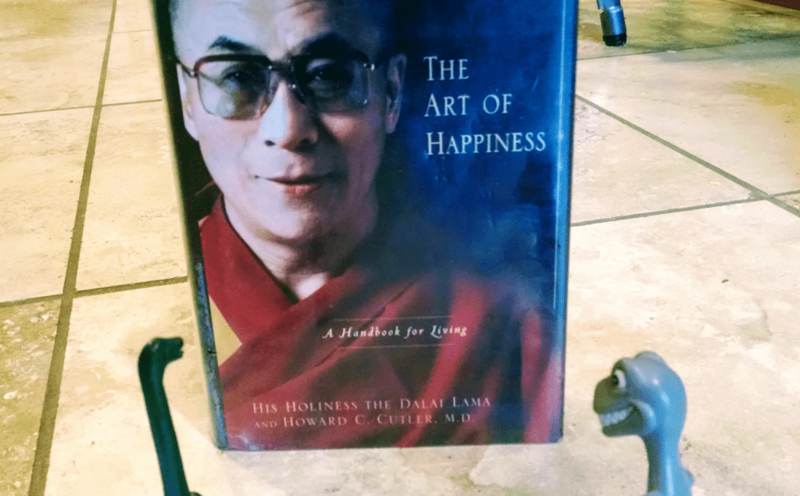 The main thing that I’ve learned from the book is that we can control our happiness through discipline and training our minds on how to react to certain situations. I have to work hard at it, but is there anything less worthwhile than pursuing happiness? I don’t think so. Fill your time with meaningful work. Discipline your mind and body. Work on identifying negative thoughts and influences. Learn how to deal with them. Don’t feed the Bad Wolf. Leave the world a better place because you have lived. Tread lightly and help others. and you’ve set yourself up for happiness. Get in the best shape of my life: Currently, this is taking the form of P90X workouts, running and biking. More on this in my performance update next week. Devote at least 20 hours per week to work I’m passionate about: This is the epiphany I keep hinting at and I look forward to telling you all about it in a post next month. Discipline my mind: I spend too much time farting around in email and Twitter. Give back: I’m not sure what form this will take yet, but I’d like to use my computer and/or building skills to help my community. Now, I turn it over to Mrs. 1500 who was very, very naughty. Mr. 1500 has spent $18 (total) on his haircuts in the past 10 years. I recently got an amazing cut, but was surprised at the cost. Mr. 1500 was shocked when I called him to tell him. We live across the street from a delightful woman and her mother, both of whom are hair stylists. But they’re not Super-Cuts stylists, which is more my speed, cost- and style-wise. When I was a stay at home mom, I spent as little as possible on my hair, because it was always in a pony tail. I probably spent more on hair ties than hair cuts. But now I have a Real Job, where I have to look presentable twice a week, with makeup and hair that isn’t in a pony tail. Frequently, I make videos for the whole internet to see, which makes me slightly more vain than I used to be. Back when we first moved into our house, both of the women across the street ended up on crutches. J was on them for 6 months for some horrific break, and B ended up having knee surgery during this same time. J noticed me outside and had asked me if I could help her get her mother into the house when she came home from the surgery, and of course I said yes. They had this really awesome ice/knee pad thing with a pump (think an igloo cooler) that circulated ice cold water around her knee, but was awkward and heavy, and they have stairs to navigate. Twice a day, I would go over and help B get up/down the stairs and brought the ice pump thing up/down the stairs since I had four working limbs. Mr. 1500 note: Come on, tell the readers what your haircut cost! As a way to say Thank You for my help, J offered to give me a haircut. I finally took her up on it, and was absolutely astonished at her skill level. But you can’t keep getting free haircuts for life, simply because you brought an ice bucket down the stairs for a few weeks. So I started paying for them and was a little surprised at the cost. We talked about color, because my hair is a not-beautiful shade of brown. In addition to being an amazing stylist, J is a master colorist. So this last appointment included color, too. I never asked what it would be beforehand, which was my fault. I was a little surprised when I went up to the desk and she said $127. Plus I have to tip, which is a story for another day. So I walked out with $152. Mr. 1500 note: $152 for a haircut?? What? Huh!? How did this happen? What has the world come to? Arrrrgh!!!! At $152, Mrs. 1500’s haircuts are 1000 times more expensive than mine! Aaaaaaaaaaahhhhh!!! I totally love my hair, but Mr. 1500 totally did NOT love the price, as evidenced above with his ridiculous ranting. But I only go every 6 months and spend $0 on hair products in between visits. But $300/year is a lot of money to my frugal heart. But it looks so good. This is in my Top 5 Greatest Haircuts of All Time. Maybe Top 3. So, how much do you spend on haircuts? Post Script: My sister was here over Thanksgiving, and she is not a frugal person – although she is making more of an effort based on what she had heard me preach for the last 40 years. When I asked her what she spends on a haircut, I was really hoping to be validated. Instead, she told me she spends $35, but will go up to $45 if she really likes the stylist. Doh! Haha, this is a great round up of happiness quotes segued into a story about expensive haircuts. I’m on Mrs. 1500’s side on this one though and I encourage her to have you watch Chris Rock’s 2009 documentary “Good Hair”. You’ll be grateful that you’re only spending $152 twice a year. p.s. Eleanor Roosevelt would have been a badass blogger. I get my hair cut 1-2 times a year and with color (east coast prices) it comes to ~$125. If I get it cut 2x, I usually only get color once. But, that is one of the things I save up for during the year. This time I skipped the color and it was a lot less. I do go to a salon. This last cut was to a pixie, so I am hoping maintenance will be less expensive than long hair, but I can also grow it out, and not need another hair cut for a while. If your frugality bone (#1 I don’t know where it is of all 206, #2, or Mr. 1500s) hurts from the cost, is there a way to negotiate the price, or do some other help to lower the cost? Help with a financial program you are good at or talk Mr 1500 into helping with a small repair? Boys and their short hair and low thermostats, jeepers! Thanks for the validation, Jacq. Ooh… That’s some money. I was quoted a huge sum to color my hair yesterday. They are waist length and simply a lot so it’s quite justified. But here I am wondering if the smaller place across the road can do it for me at a swallowable price. That being said I just spent a huge sum (to me) on mani-pedi yesterday after years and I love how my nails look today. What I did not mention above is that this is almost my only beauty expense. And I have had great haircuts before. In Madison, WI, I got such an amazing cut that I sent a letter to the owner of the salon, telling her how awesome it was. The stylist left before I could get a third cut with him, so I posted on Craigslist that I was looking for him. One of his friends saw it, and shared it with him, and he contacted me, telling me he wasn’t cutting hair any more. What?!? That was about 6 years ago, and I have found a new stylist I like, who is talented, understands that I’m not coming into the salon every 3 weeks, and gives an amazing cut. But that amount of money is so difficult to part with. Well my wife spends $200 on a cut and color every two months. Be grateful Mr. 1500. ? But wow, that is one expensive hear cut…. it must be really really nice for that kind of money. Let alone stay in the right shape/model for at least a couple of months. Mr. CF spends about €12-15 every 2 months or so. Mrs. CF about double that every 6 months or so. Still do not look like we came directly out of a garbage dump though….. I work with a guy who would really appreciate that pun. My wife pays for her cuts though and it goes for about $45 every other month. I commend her for keeping it down though, because she does her color herself at home which saves quite a bit. And she gets compliments of her color-job by her stylist so she isn’t sacrificing there. We could look at it like We bought a Wahl clipper set and that balances out my $152. OR since I’m the one cutting his hair, at a rate of once every 3-4 weeks, maybe $300 per year in total for our haircuts is a bargain. Mrs. 1500’s haircuts could cost less, and they could cost more. It’s not like she’s going every month and paying that price. Finally, it’s hard to find a good stylist. Mrs. SSC’s all keep moving out of Houston… Even the Supercut ones that do a great job on her hair. Thank you, Mr. SSC. It IS hard to find a good stylist – and she’s really good. I spend $15 every 2-3 month on my hair cut, and my wife between $100-125 every two months for cut and color. She has been going to the same stylist for over 5 years. It’s something we’ve discussed about reducing, but it’s one of those things that’s important to her. We just factor it into our budget. Like Mr 1500 I cut my own hair and my kids too. My wife gets her hair done but usually its Supercuts. I’d venture to guess family of 4 hair budget is maybe 45 dollars a year. Do you have all boys? 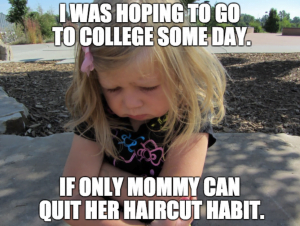 Our girls get their hair cut at Supercuts 2-3 times a year. 2 boys, it does I’m sure make it a lot easier to cut their hair. They make up for it in food intake. Full Time Finance recently posted…What is Marginal Utility? I usually spend $40-$50 on a haircut, but only get it cut every 2-2.5 years. I figure when I cut off the amount that I do (usually at least 10″ that gets donated), I want someone skilled to shape it well enough that I’ll be happy to leave it grow out for another couple years until the next time I chop it all off! 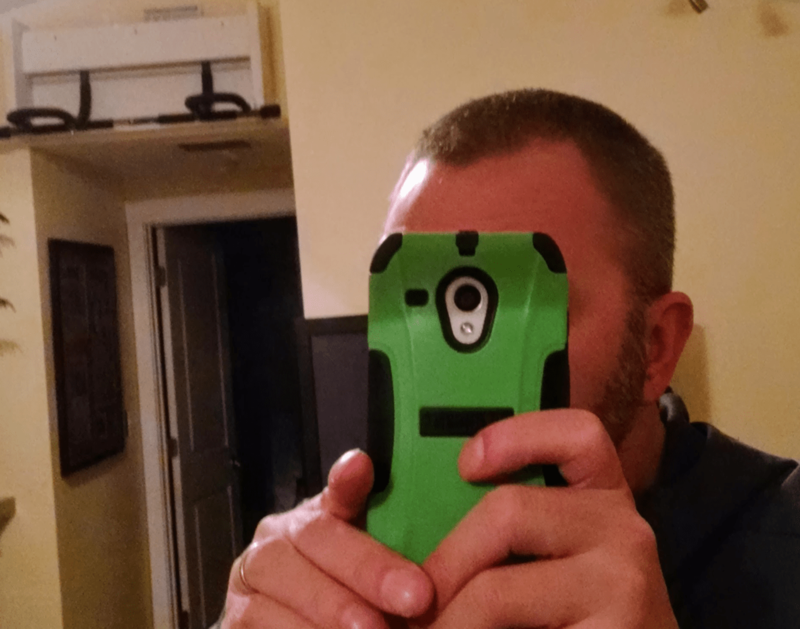 Count yourself lucky Mr.1500….in the world of expensive haircuts, $152 isn’t all that bad. I thought it would be somewhere in the $300-$500 range. It could be far worse! I’m sure Mrs.1500 makes up for it in other ways too…perhaps she’s a really good coupon shopper. Or maybe she’s such a good cook you never need to go out to eat. Life has a way of balancing these things out. I am a really good cook, but we’ve been eating out much more recently with all the craziness. Mr. 1500 is going down to 3 days a week starting next week, so we should ease up considerably, and get that down again. I think I missed the post on happiness, but I just got “Happy Money” by Elizabeth Dunn out of the library. I’ve just cracked the cover, but think you might like it. Also, I know we’ll miss you when you’re in town (again!) but check out Boulders on Broadway in Tempe. We like hanging there on some trivia nights. If you go on Monday for happy hour, you get half off all pizzas (try the Carver). I love your list of ways to feed the Good Wolf! It seems like my life has gotten so busy lately that it’s hard to incorporate these positivitiy-building exercises. But it’s important to kick the excuses to the curb and just do it. And don’t feel too horrible, Mrs. 1500! In my spendy days I spent $200+ on a hair appointment. It did include a cut and a color, however. I used to LOVE LOVE LOVE dyeing my hair. I hated my natural hair color. But I’ve realized that it’s a) super expensive b) bad for my hair and c) pointless to do it. So I haven’t dyed my hair in almost two years! When I need a trim, I use a coupon for an $8 cut at Great Clips. Since I wear my hair long, this happens maybe once or twice a year. Hopefully I can convince Mr. Picky Pincher to learn how to cut my hair to save even more moolah! Mrs. Picky Pincher recently posted…What a Frugal Week! Thanks Mrs. P. I do not trust Mr. 1500 with my hair, though. I have weird cowlicks. Men’s and women’s haircuts aren’t comparable. And $300 a year doesn’t move the financial needle one way or the other at your level. Remove the guilt and shame from something that makes you happy and that you can easily afford. Or chalk it up as a business expense if that helps you get past the mental hurdle. And if you’re looking for stats, I think my wife spends about $75 but gets her hair done every 12 weeks so it’s about the same total dollar amount annually. I agree with Danny, men’s and women’s haircuts aren’t comparable. We all have something that we choose to spend money on even though it is not necessary. I have gotten two hair cuts in the past 6 years, but stopped getting them because it turns out I value a dinner out that I don’t have to cook or clean up after more than I value a good hair cut. But that is me and what fits my finances. I do think there is something to say for feeling confident in your appearance. It’s funny, I had a very similar experience 8 years ago (I remember it clearly). It was the best cut/color I’ve ever had and I spent nearly $200 on it. Like Mrs. 1500, I probably should have asked about the cost prior to getting in the chair. Now I spend nothing and it probably shows. My mom cuts my hair and I stopped highlighting it. But, honestly, if I could be guaranteed a great (and I mean fantastic!) cut/color and did it would last for 6 months, I would seriously consider it. My mother went to a salon because she had a coupon. She ended up with the absolute best haircut she had ever received, but it cost her $90 and she never went back. She has a knack for finding the complete worst stylist in the salon when she goes. This cut was so chic and she looked amazing. I loved the rocking chair quote. I spend more time worrying than I should, and that is a good way to think about it. My hair cuts/colour cost about the same as Mrs. 1500 and I go three times a year. I don’t feel the least bit guilty about it either. My stylist is a really nice person, and we’ve got to know each other well over the years. She has dropped us off to the airport more than once, and helped us procure a lovely (only slightly used) Christmas tree for free. So if I was to think of this it terms of returns, that money has been pretty well spent. That isn’t how I think of it though. There are things we spend money on and things we don’t. This is one of the dos. You know, I don’t think this is a crazy price – and I live in Kansas City – my cut is $50 (without tip) and with color it would be another 90 (again, not including tip). I guess I’d say I think the cut matters much more than the color in terms of prioritizing which to pay for. The at home color kids have gotten SO much better over the years. I think haircuts like many many things in life, you get what you pay for, and you’re in a role, as you described in which, it matters and you’re more visible. I can understand paying more. And I used to cut my own a couple of years ago when it was really long. it’s now only just past my shoulders, so I can’t cut it myself as easily. I have long, thick, dark brown, “beachy-wave mixed with loose ringlets” hair gifted to me by God. He must have been in a good mood that day. Consequently I do not judge anyone trying to get really nice looking hair since I have an embarrassment of riches in that department. $152 is a lot but at only two cuts per year and no hair product purchases you are still below average for most women with decent hair that wasn’t exactly a gift from the Almighty. Lol. I might spend $40 per year on product (one can of curl-enhancing product and two bottles of special conditioner will last all year) and $25 on one Great Clips trim. I don’t think comparing the cost to a guy that uses a trimmer in his house is a fair comparison. Especially since this is the disreputable Crocs/white tshirts/black tshirts guy we are talking about. Your self-confidence has value and if a nice cut gives it to you when you are putting yourself out there on the videos…do it! Wait, how do you get two bottles of conditioner to last all year?!? I only need to use it on the ends and I only wash my hair twice a week. Thick, curly hair can do that. If it were fine and/or very straight then I would have different plan. Sometimes the conditioner lasts even longer. lol I do chug through shampoo, though. I order enough for a year when I can get good discounts on Black Friday and then don’t think about it until the next November. haha I am totally guilty! My last cut and colour cost me nearly $400! I almost fainted! small things like to add up at salons, toners, washes, styles. Even though I asked the stylist to skip the blow dry because I was going to bed right after! After that, the next time I needed to touch up my hair I decided to use a box dye ($11) and dyed my hair back to my original colour. I’ll never change my hair colour again. I’ll probably pay for a hair cut twice a year now, but I’ll spend $50/visit instead of $400! It’s also not as easy as buying hair clippers and doing it yourself. If you have longer hair you need to get it cut or trim off the ends every once in a while. If I had short, buzzed hair I would totally spend $0.15/cut like you, Mr.1500! Wow! The color I was initially talked into, but I really like it now. My dad is a redhead, didn’t pass it along to me, but I have his coloring so my mousy brown locks get colored red and it looks natural and really brings out the color in my face. Beautiful! We have red head in our family too! I was not blessed, but red would not suite me. Sounds like it was well worth the cost! Mrs. T cut my hair and I get a haircut roughly every 5-6 weeks. Mrs. T has been going to hair salon schools to get her haircut. Sometimes it takes a bit longer because it’s students cutting the hair but it only costs like $15 or so. WAY cheaper than the $152. Did Mrs. 1500 tip after spending $152 on her haircut? I got a massage with the cut, too. And the $152 is with tip. I think in return Mrs. 1500 now has to keep the thermostat at somewhere around 52 degrees to recoup the $152 spent on the haircut…….I might have just solved your thermostat problem this year. I also might have given Mr. 1500 an idea that he will run with and then create an even larger battle, either way, Good Luck! I felt the same way! And because I like my hair long, it kept getting pricier and pricier. I hated going to the salon, because they always ended up using more color than they thought they’d have to because it’s so thick. So about 5 years ago, I decided, “no more color!” My hair color isn’t fabulous, so I like to mix it up now and then with a natural version – Henna! you can buy it on Amazon, it’s permanent, and comes in different shades…and it’s fun. I like the redder versions. I also you-tube’d how to cut your hair yourself. Which can be dangerous. But, with 1. longer hair that 2. is not layered, and 3. is quite wavy, it’s a lot more forgiving! Stylists are probably poking their eyes out reading that, but I have to say, it does not look half bad and I get what I want it to look like! Half the time, the cut at the salon would not be what I wanted at all. So, I’m happy with it. Free haircuts with professional shears. And boxed henna once in a while. It comes out to about $30/year tops. My wife just brought this up today. For the past few yrs she has been getting her hair colored once a year around Christmas time. She turns 44 is a few days and gray has gotten to the point where the new growth two tone color is obvious. She asked if I was OK if she just went gray instead of doing the once a year $90 color treatment. I said of course I’m OK with it. My wife is pretty awesome. I went off the grid for a few days, bummed I missed the Estes Cone hike. All that debate about whether it was worth it. NO freaking pictures of this fabulous haircut?? Jim, thanks for asking! Here is my $.15 haircut! Wow! You need to pay Mrs. 1500 more for THAT cut. My wife and I go to a person show has a hair cut studio in her back yard. Women varies, haircut less than $20. I have to agree with Mr. Collins. We need the before and after pics of the haircut. Isn’t it always best of the internet judges what something is worth 🙂 Just kidding but it does seem a lot. Wait…my wife told me she just spent $200 on a haircut and color with a tip. She says you got a bargain and it’s totally worth it if that’s something you value. Mustard Seed Money recently posted…Are You Dressed For Success? Holy mackerel! Still, my coworkers spend $200-300 per haircut (with colour) so perhaps Mrs. 1500 got away cheaply! I went the same way as you. My handy $20 trimmer trims partners, friends and well, anyone that will have me’s hair. It came with a pair of scissors that I use for my 2min bi monthly trim. If I can find a way to have someone pay me for a haircut or two I could make up the investment in a jiffy. I’ve been cutting my own hair (with just a pair of scissors) for the last 10 years. It’s long, healthy and gets a lot of compliments. Recently I started dying it with henna, costing me $4 for the initial dye and then I top it up once a month or so at maybe 25-50 cent a time as I only use about a tablespoon of the package. Vicki@MakeSmarterDecisions recently posted…New Series – Smart Travels! What a coincidence.. I was eying the exact same haircutter that’s sitting on my Amazon cart for the past year.. Maybe your post was a sign I should take the leap of faith? That’s pretty diligent, getting your hair cut once a month. I generally hate going to get my hair cut (I don’t think anyone will believe me but it’s not because of the money, it’s because of the time it takes to get there, waiting, etc.) so I usually get one once a quarter. I sure get my money’s worth by the time that I get my hair cut! I spend maybe $20/year on shampoo, no other products, no make up, blah blah blah, so to me it’s worth it, and isn’t that the point? I’m biased toward a great haircut though. There’s something about having just a simple well done cut that makes you look ten times more polished. Which isn’t to say I’ve gotten more than two cuts at Supercuts in the last three years. because I’m very lazy. I used to be a Supercuts girl. A friend of mine talked me into seeing her hair cutter gal and I finally did. I have the view of “it’s just hair” so my only rule is that it stays long enough to pull into a pony tail, but otherwise, I feel these people are the professionals so I tell them to do whatever they want. A woman saying this tends to freak hair cutters out. This particular hair cutter I went to, confirmed about 5 times I really was ok with her doing anything and finally did an amazing cut and color – just like you, I was amazed at the difference and loved it! She was actually very low priced based on some stories I’ve heard and I left for $100 – tip included (cut and color was $80). Plus…..the gal was amazing – fun, good stories, light hearted, started the business herself…..and on and on, I really enjoyed her company. I continued to go. I even took my daughter to her for a fancy style up do thing for her first piano recital and then ongoing for her haircuts since it was about the same price as Supercuts for kids. After a couple years though – this is about the time I started paying little more attention to money – I realized that it started to hurt a bit when I dropped that $100 because after all, it’s just hair. I also realized that I was basically paying $100 for a quarterly friendship, which seemed silly. I stopped going. My grey has returned and I give myself a trim every few months to cut the dead stuff off the ends. I actually talked my husband into doing the latest one for me. Most days, my hair is in a p0ny tail, even at work. But there are also days where I will style or straighten it – and it still doesn’t look horrible without the professional cut. I actually get more compliments on my grey “highlights” than I did on my professional highlights! 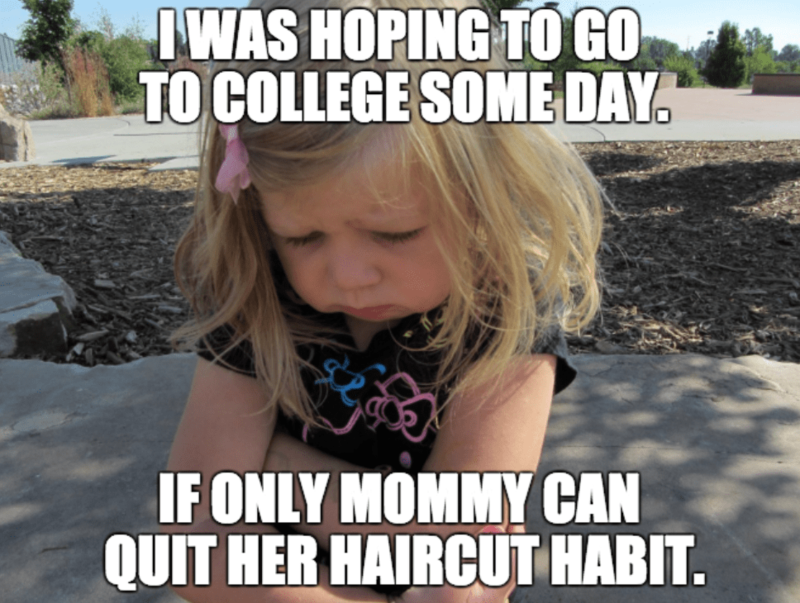 I mentioned in a previous post that my daughter (11 yrs old) is on a salary plan and one of her responsibilities to budget is haircuts. She too, has made the decision that I can cut her hair well enough for her to put the $20 it would cost her for a professional cut toward something else she would rather have and have me trim up her ends periodically. That said, I think the true test is how important is it to you. Does it REALLY make you feel better about yourself than your old cuts? And while you may be surprised at the cost, is it worth it to you? If so – then you have the money, don’t feel bad about it! But, if you ask yourself these questions and find, like me, that it really isn’t that important and dropping the cash hurts a little, maybe it isn’t quite the priority you think it is and you can find something more valuable to trade your money for. Or, if you are somewhere in the middle, maybe the price is negotiable to get to a place where the sting isn’t as deep but you still get the service. One thing that struck me about this post is the idea that happiness is binary. That a person is either happy or unhappy. The book, Happier by Tal Ben-Shahar, talks about happiness in terms of degrees. It explains that a person cannot be described as either happy or unhappy but rather a person can be happier or less happy. I came across this 10 years ago: http://www.lazymanandmoney.com/women-what-is-your-hair-budget/. My wife was spending around $200 (peaking $300 at one point in Silicon Valley) and it was every 6 weeks (coloring was necessary). Now, she just gets the color from the stylist and gets a cut at the Navy base (which is super cheap). The cuts at the base are $8 and the coloring is around $110. So at least it is a good amount of money saved. You have to wonder why drug stores devote a whole aisle to boxes and boxes of hair coloring products and celebrity endorsements if no one is buying their economical coloring solution? Well I can personally attest to the fabulousness of your haircut, Mrs. 1500! And impressing me is clearly what matters. 😉 I know lots of people get cheap cuts, but I’m with you on needing to go a step up if you’re a woman working in an office… as for what amount feels comfortable to each of us, that’s another story. 😉 Though once we quit next year, we’ll definitely do more self-cuts… I’m personally looking forward to bringing back punk rock hair styles among middle aged people… also known as whatever my hair looks like when I take scissors to it in a random way. Hahahaha. I’ve been going to the same lady at the Hair Cuttery for at least the last 15 years. I’m boring and get the same cut each time, so I don’t even need to tell her what I want. I think the cost is up to $19 now and I usually tip her $11 to make it a nice round $30. BTW – good luck on your P90X plan. I did it about 4 years ago and followed *most* of the workouts and meal suggestions. Very noticeable improvements in weight loss, strength, and energy level after completing the 90 days. I still run a lot, but should probably redo the program or something similar to regain the muscular strength. Ok, you will think I’m crazy but I spend ZERO on haircuts. My husband gave me a haircut shortly after we started dating and I have not been in a salon since. I spent too much on salon haircuts and the result left me less than satisfied, and I was telling him I was going to grow my hair to my ankles. He told that I do need to keep my ends trimmed so it would look good growing out. And I asked if he was going to do it and he said yes. He gave me a great trim with the pro grade shears, pinning and sectioning my hair, etc just like the salon minus the hacking, yanking and burning my scalp with the blow dryer. I was ecstatic he gave me the best haircut I could ever remember getting and it was free. He does my trims every other month and my best friend had a really bad haircut experience and she asked my hubby if he could cut hers for her. Well he is now her stylist, she gets hers trimmed on my schedule. She likes his work and said there is something very wrong when she spent $275 at the salon for cut and color to get her hair ruined, and now she is getting her hair cut in my dining room by my husband for free and getting better results. He does my color and hers with henna, and the color beats the salon monotone, straw results. She is great, she has agreed not to disclose her stylist despite many compliments and requests for who her stylist is and can they book an appointment with him. I joke with him that he should consider a new career, but he doesn’t want the drama of running a shop. He said he is happy doing mine and my best friend’s hair. He doesn’t want to deal with giving ladies a boy’s haircut. He said that was too creepy for him. So my hair looks great, I get compliments and my stylist remains limited access. I don’t want strangers showing up, I want a quiet home life. For him to do it and charge, he would have to get a license. He already has a good paying job and we are quite busy nights and weekends. Trying to start another business, let alone getting licensed first would not work for us. But I still get great looking hair when I want him to do mine. So that’s fine with me. I get my hair cut about twice a year at Great Clips for ~$15/cut. I plan to use a Wahl going forward since my need to look professional no longer exists. My wife gets her hair cut once a year at the same Great Clips for ~$15, but she’s in the ponytail-wearing crowd. And thankfully hardly wears makeup or perfume, avoiding another one of those “typical” beauty spending categories. However, she does spend $60/month on pedicures. She calls them “relaxing” and “a social outing” because she goes with a friend. I tell her to just give each other pedicures at home which doesn’t go over well. My wife spends pretty much the same on a haircut alone. But her “Me days” don’t end with just a haircut and some color, she also gets her nails done and throws in a massage to boot! Such an expensive day out!